So, you have already created your action box. 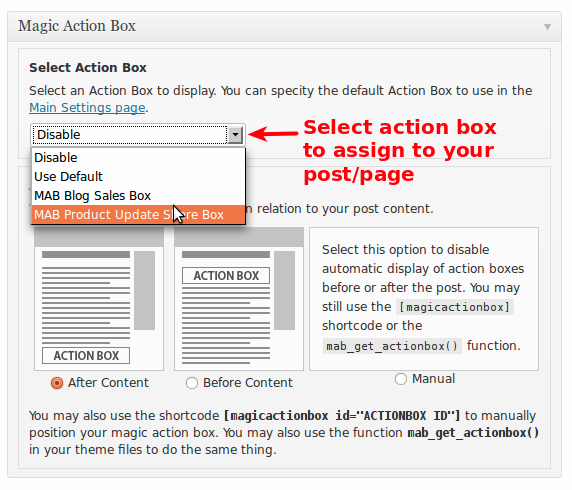 This guide will walk you through the steps to add an action box to a blog post or page. You can set the action box to show up before or after the content. Edit the blog post or page where you want your action box to be displayed. Scroll down past the content editor and look for the Select Action Box dropdown. Choose the action box that you created. By default, the action box is set to be displayed After the content. Just choose a different placement setting if you want to show the box before the content.